I may have an oily complexion, but I have always had dry skin on the rest of my body. My legs are the worst especially in the winter. I never wear socks (I know I’m a little crazy) so I have dry patches of skin on my ankles. It’s not pretty to look at it and it doesn’t feel nice. Lotions help, but I’m a low maintenance kind of gal and always forget to put it on after my shower. 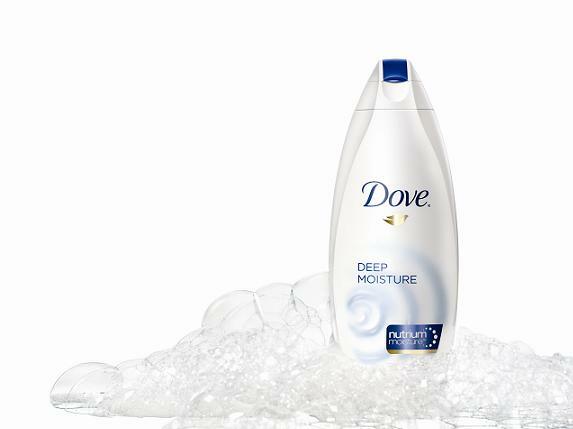 I recently started using Dove® Deep Moisture Body Wash and it has made a big difference in my skin. It contains Nutrium Moisture which is a rich blend of 100% naturally-sourced moisturizers that are completely absorbed by your skin. Instead of washing with soap, I use a bath pouf with a little body wash. It smells clean and fresh and it works into a rich and luxurious lather. It also rinses off easily so there’s no soap residue left behind. Instead, I’m left with silky soft skin. I noticed a difference in my skin after the very first time I used it. My legs which were extremely dry drank up the moisture and felt so soft. I love it because it saves me an extra step of having to apply lotion after my shower as Dove® Body Wash nourishes deep down. So not only does it make my skin feel wonderful, clean and smooth, but it also saves me time! And anything that can save me time is a good thing! And those dry patches on my ankles? Gone! This is a fantastic product and I’m hooked on how good it makes my skin feel. I encourage you to discover the beauty of Dove® hydrating nourishment yourself. Your skin will love you for it! CookieCoo Dancing Star (Free iOS Edutainment App) Giveaway (WW) | Win $10 iTunes GCs! I really need to go back to using DOVE I loved it when I used it.. not sure why I stopped.. probably price related. I absolutely love all dove products. I use Dove Body Wash and love it! I keep forgetting to moisturize which I’m going to do right now! LOL! This stuff is great! My little boy has eczema really bad and Dove bodywash is just about the only thing I can use for him! Dove is a wonderful product. I’ve never been disappointed when using one of their products. I am a lover of dove products. I was thrilled years ago when they came out with their hair care line! I love Dove body wash! And it is so affordable. I’ve used Dove since I was a teen, tried other brands but I always come back to Dove. Love it! Love the Dove!!! Thanks for sharing! I’ve been using Dove for over ten years, it’s one of my fav. brands, love them!